The renowned mountaineer told us about a future train and hotel on Mount Everest, the reason he sleeps in a tent at home, and why he doesn’t remember climbing the world’s highest summit. 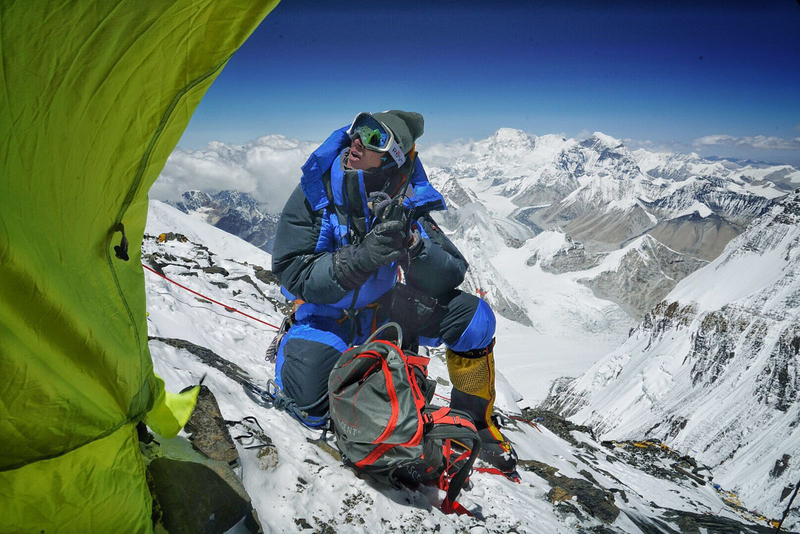 Last year, without supplemental oxygen, Adrian Ballinger summited Everest. It was his sixth ascent of the world’s highest peak. He’s also topped Earth’s fourth-, sixth-, and eighth-highest summits: Lhotse, Cho Oyu, and Manaslu, respectively. A world-class mountaineer and skier, Ballinger also stands alone as the only American to ski two 8,000-meter (26,250-foot) peaks. And he was the first ever to ski down the Manaslu. On the business side, Ballinger’s company, Alpenglow Expeditions, is one of the preeminent mountaineering guide services in the world. 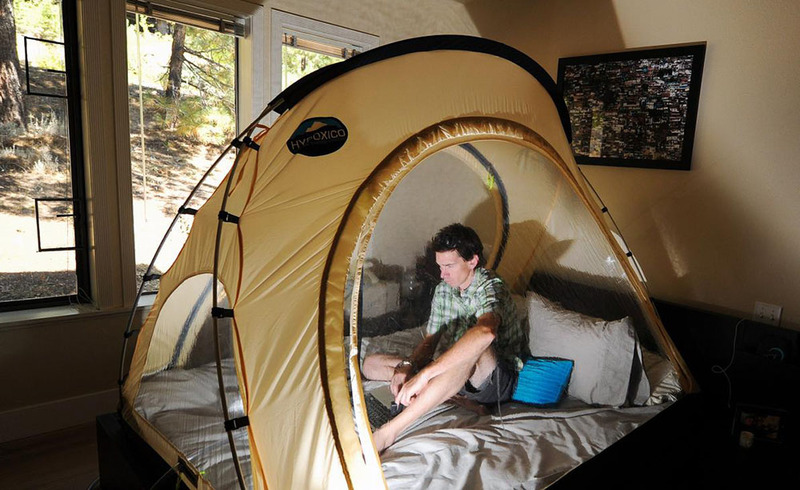 He’s helped pioneer the use of oxygen tents to help climbers acclimate. 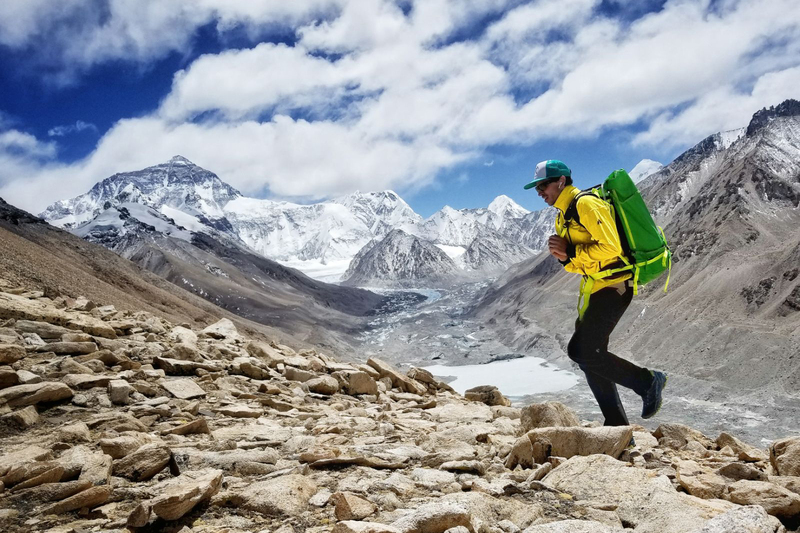 And that has allowed Ballinger and his clients to make rapid ascents on a variety of peaks across the globe, including Everest, Ama Dablam, Kilimanjaro, and Aconcagua. Needless to say, the 42-year-old never stops pushing the envelope when it comes to climbing major peaks in the Himalayas. Recently, Gear Junkie had a chance to catch up with Adrian prior to him setting off to Tibet for another climbing season. He told us more about his plans for the season ahead and his thoughts on the evolving climbing environment on the world’s tallest peaks, including Everest. Gear Junkie: You have big plans for the spring climbing season this year. Tell us what you’re planning. Adrian Ballinger: I leave for Lhasa, Tibet, on April 18 to begin my expedition, which will involve a Himalayan double-header this year. 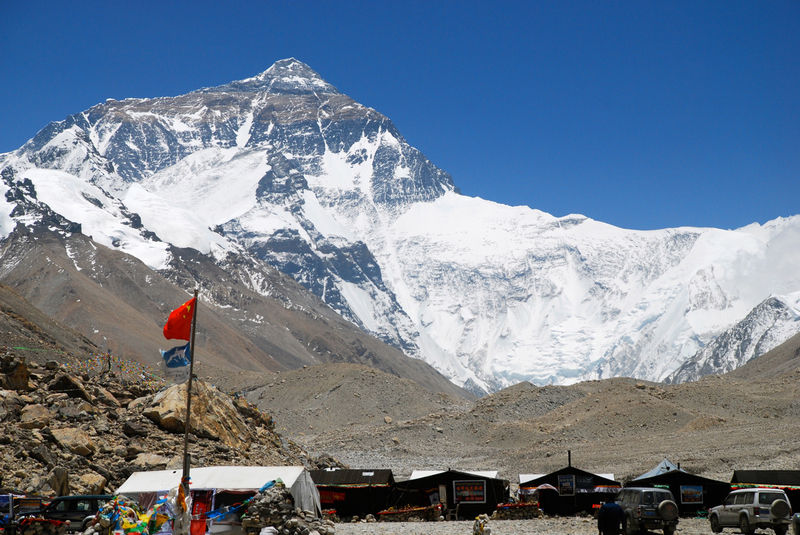 The plan is to acclimate on Cho Oyu first [8,188 m/26,864 ft], then head over to Everest [8,848 m/29,029 ft]. In fall 2016, you made a rapid ascent of Cho Oyu with Emily Harrington. Will you be making the same type of climb this time? Yes! Emily and I used oxygen tents to acclimate prior to setting out for the Himalayas. This enabled us to go door to door in just two weeks. We figured if it worked then, it should work on Everest too, so we’re looking to make both ascents in under four weeks. 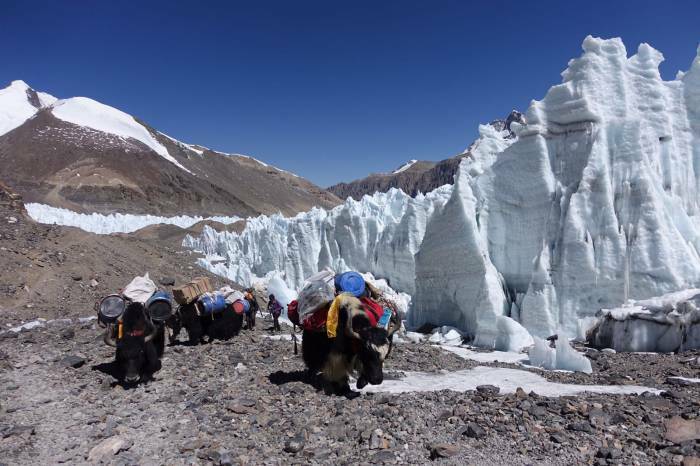 Will Cho Oyu serve as just an acclimatization climb, or will you nab the summit before transferring over to Everest? Our focus will be to acclimate on Cho Oyu first. But if the weather is good and we have a long enough window, we’re really hoping to summit. 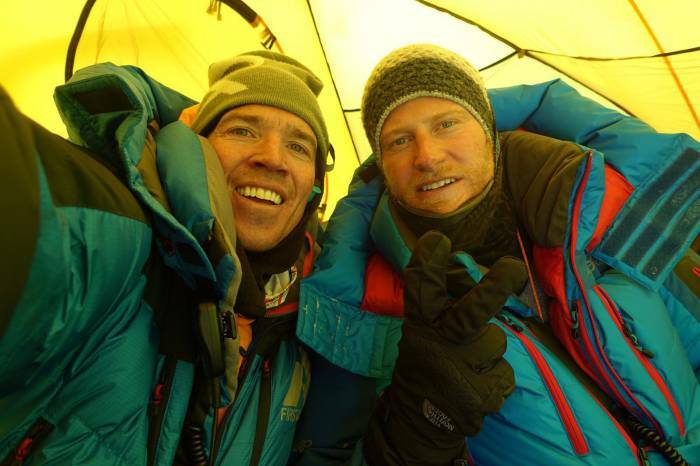 Everest is our primary goal for sure, but our team of four is really motivated to make this [double ascent] happen. Your mountaineering company, Alpenglow, has been using oxygen tents to help clients pre-acclimate before major climbs for a number of years now. What benefits does it give you? We’ve had a great deal of success using the oxygen tents, as it allows us to prepare for the altitude long before we ever reach the mountain. This cuts down on the time required to summit, shaving off several weeks. Our clients end up having a higher success rate because they spend less time away from home and tend to stay healthier too. How did you come up with the idea of using oxygen tents to acclimatize ahead of the start of an expedition? It actually came about due to purely selfish reasons. I found myself spending 30-plus weeks a year on mountains, and I wanted to find a way to be home more often. I started noticing how endurance athletes used oxygen tents to help them recover more quickly and perform better at altitude. I thought maybe I could use one too, allowing me to stay home longer before the start of a climb and summit quicker, too. Speaking of oxygen, the last two years you climbed Everest without using bottled O2. This year, you’ll use an oxygen tank and mask again. How does that change the game for you? I’m really proud of the fact that I helped Cory Richards summit without oxygen two years ago and was able to summit myself last year. But I’m so excited to be using oxygen again this year! While climbing without a mask and oxygen tank, I lost the enjoyment of mountaineering on the upper slopes of Everest. In fact, I don’t even remember much of the climb. Going back this year, it’ll be like sumitting from the north side for the first time. You don’t remember the climb? Unfortunately, no. I don’t remember much from the summit push at all. We made the jump to the north side for the 2015 climbing season, which ended up being cancelled due to the earthquake in Nepal. Then in 2016 and 2017, I climbed without oxygen and have almost no recollection of those ascents. Climbing with oxygen this year will be like discovering a whole new route for the very first time. On top of that, I am first and foremost a mountain guide, and I’ve missed climbing and guiding with my Alpenglow crew. Why do you prefer climbing on the north side versus the south? Plain and simple: It is much, much safer. 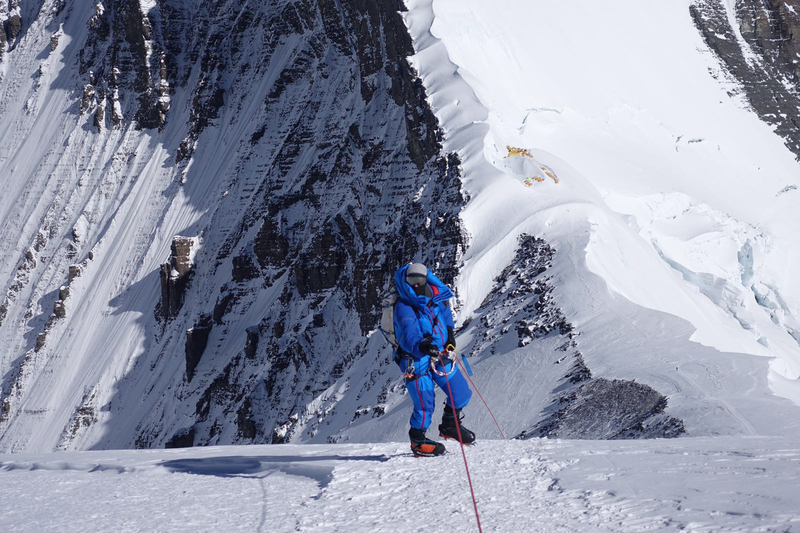 On the south side, the teams have to pass through the Khumbu Icefall multiple times, putting themselves in danger each and every time. That section of the climb is incredibly unstable, and I just didn’t like putting my clients, or my Sherpas and guides, in that kind of danger. 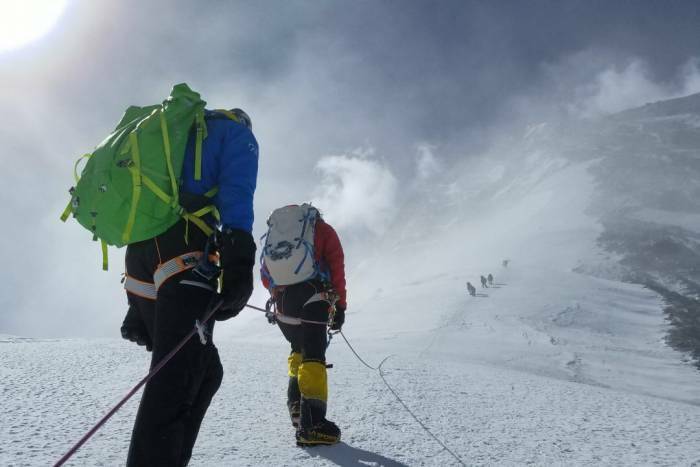 Beyond that, however, there are fewer hazards to contend with on the Tibetan side in general, and it doesn’t hurt that there are fewer climbers too. How has it been working with the Chinese government rather than the Nepalese? The Chinese do a better job of managing the mountain in my opinion. They handle the installation of the fixed ropes to the summit, have a better presence in base camp to enforce the rules, and aren’t afraid to pull teams off the mountain if they have to. In Nepal, the liaison officers rarely show up, there are a lot of politics involved with the teams installing the ropes, and the atmosphere is less professional in general. The Chinese have announced plans to invest heavily in the future of Everest. How do you feel about that? I’m excited to see where it goes. They’ve already announced plans to have rescue helicopters in place by 2019. They have already built a road to base camp that makes logistics a lot easier, and they’re planning on creating a pressurized train to bring visitors too. A mountaineering training center that includes a hotel is in the works too. The plan is to make the mountain much more accessible for the average person, much the same way that European countries have made the Matterhorn and Mount Blanc more accessible too. Do you have any concerns about those plans? Of course! I don’t want to see Everest get overrun with visitors that don’t belong there, or turned into a tourist attraction for the masses. I want it to remain as pure of a mountaineering experience as possible. So while I welcome these developments, I hope there are some limits too. What are your thoughts on the low-cost operators that are becoming more common on Everest, particularly on the south side? Everest is truly at a crossroads at the moment. These low-cost operators are changing the game by making it more affordable for more climbers to come to the mountain. This means the mountain is getting more crowded, which could lead to safety issues. I think it’s really important to regulate all of the operators to ensure that the guides have proper training and are carrying all of the necessary safety gear and communications equipment. Do you think Everest is less safe because of these budget operators? Not necessarily. It is important to note that there are both good and bad operators on Everest, and the low-cost movement didn’t begin with the Nepali companies. That said, I think we as an industry need to do more to help our clients ask the right questions. Too many show up to base camp and are surprised by the discrepancy between the different companies that operate on the mountain. They’re not all created equal. What changes would you like to see made to make Everest safer? I think Denali is a good example of how a mountain can get safer through new rules and regulations. The use of mountaineering rangers above base camp have helped make that mountain far safer than it was in the past. Those rangers are not only there to ensure that everyone is adhering to the rules, but they can also lend a hand when climbers run into trouble. I think it would also be great if the operators weren’t so afraid to call out the bad apples amongst us. This might force them to elevate their game or educate climbers about which operators can be trusted and which should be avoided. After your Himalaya double-header this spring, what do you have planned for the rest of the year? Any other interesting expeditions in the works? Yes! In the fall, I’ll be part of a four-person team that hopes to make the first ski descent of Lhotse. I’ll be joined by great mountain athletes like Hillary O’Neal and Jim Morrison, who I’ve climbed with regularly in the past. We tried to do this a couple of years back during the spring but didn’t find enough good snow to ski on. We’re hoping that there will be better powder in the post-monsoon autumn season to finally complete this quest. Sounds amazing! Good luck on Lhotse later this year, and on Cho Oyu and Everest this spring. Thanks! You’ll be able to follow along with our progress at AlpenglowExpeditions.com.